On 1-Nov-2015, STSE (Junior) 2015 was conducted for students of class-X & XII.This is the second edition of this Exams introduced last year by Rajasthan Government. STSE (Junior) 2015 was conducted in three parts, Paper-1(MAT), Paper-2 (LCT) and Paper-3(SAT)). Paper -1 was conducted from 9 AM to 9:45AM and Paper-2 from 10:15AM to 11AM and Paper-3 (SAT) from 11:30 AM to 1 pm. Paper 3 SAT contains 25 questions each from Physics and Chemistry and 20 questions each from Maths and Biology. The Analysis below pertains to all Papers, which was for all STSE Aspirants. In this analysis we have rated every question on a scale of 1 to 3. The ratings are done by expert faculty of Resonance. 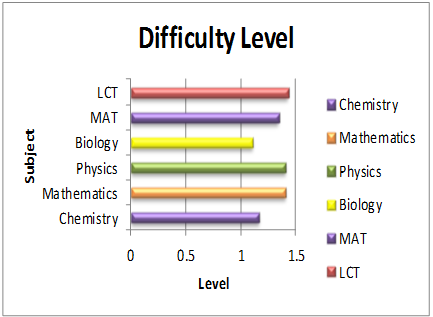 The individual ratings are then averaged to calculate overall difficulty level. Resonance Experts feel that all subjects were of easy and moderate level, while one question in MAT is having typing error (having two options same). 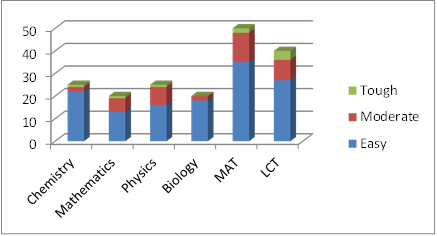 Overall questions in each subject are relatively easy and 168 marks are considered as cut off by Resonance Team. Take the ResoFAST exam to get admissions in Resonance with heavy scholarships in various classroom programs for JEE Advanced and JEE Mains. Taking ResoFAST also ensures early birds discount in the fee in addition to the scholarships.